Born Josephine Boisdechene in Switzerland, Madame Clofullia had a two-inch beard at age eight. She gained her namesake by marrying a French painter with whom she had two children. Madame Clofullia provided Barnum with free publicity when a museum patron, William Charr, took her to court claiming that she was really a man in July 1853. Thanks to Barnum's testimony as well as statements made by physicians, Madame Clofullia's father, and Monsieur Clofullia that attested to the fact that Madame Clofullia was indeed biologically female, the case was dismissed. Notice that Madame Clofullia is pictured in traditional Victorian dress, the epitome of nineteenth-century womanhood. Barnum began exhibiting General Tom Thumb, aka Charles Stratton, when the boy was only five years old and under two feet tall. Barnum advertised the "General" as being eleven years old for fear that the public would not find a diminutive five year old particularly scintillating. Beginning in 1844 Barnum and Tom toured Europe for three years and met Queen Victoria. Tom Thumb married Lavinia Warren, also a midget, in 1863. Barnum frequently advertised the couple with a child although Lavinia never bore any children. Museum patrons were fascinated by Constentenus, the Tattooed Man. His body was covered with 388 oriental designs. His fabricated biography claimed that Constentenus was captured by the Khan of Kashagar and forcibly tattooed as an alternative to death. Constentenus was presented in the exotic mode with his hair braided wearing a loincloth to convey a sense of "untamed" humanity. Barnum's posters advertised Jo-Jo the Dog Faced Boy as "The most prodigious paragon of all prodigies secured by P.T. Barnum in 50 years. The human-skye terrier the crowning mystery of nature's contradictions." Feodor Jeftichew suffered from a genetic disorder which caused him to have abnormal amounts of body hair. Barnum's "What Is It?" exhibit was one of the longest running displays in the American Museum. William Henry Johnson, pictured here, assumed the role of the man/animal for over 40 years. Johnson was a mentally handicapped man who was sold into show business by his family. His career with Barnum proved to be quite lucrative; he owned a house in Connecticut that was a gift from Barnum. 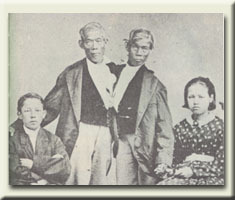 Chang and Eng were Barnum's famous Siamese Twins. Born in 1811 in Siam, they arrived in the United States in 1829. The twins were extremely disagreeable with each other and with Barnum; they believed him to be quite stingy. Chang and Eng retired to a plantation in North Carolina where they also owned slaves. At age forty-two, Chang and Eng married sisters Addie and Sally Yates, and they fathered twenty-one children. Zalumma Agra, one of Barnum's Circassian Beauties, was exhibited in Barnum's museum in 1875. Circassians were women who had supposedly been slaves to the Turks during the Circassian War. Part of the intrigue surrounding the exotic Circassian Beauties was their "not-quite-but-almost slave status. "1 The primary requirement for women who played Circassians was that they be attractive. The women who performed as Circassian Beauties obtained their trademark frizzy afro by soaking their hair in beer. Barnum's Feejee Mermaid was one of his first "humbugs." Before exhibiting the mermaid in 1842, Barnum created quite a media frenzy by distributing flyers and writing letters to newspapers that claimed a certain "Dr. Griffin, agent of the Lyceum of Natural History in London" would be traveling through New York with a "veritable mermaid taken among the Feejee Islands." In reality "Dr. Griffin" was Barnum's friend Levi Lyman. The creature, which was nothing more than the upper torso of a monkey sewn to the lower half of a fish became one of Barnum's biggest attractions during his first year of business.